The three bulls circling up. This circling of the wagons is a defense mechanism that muskoxen have employed for millennia. They face out after circling and take on predators such as wolves in a formidable wall of tenacity and horns. The calves hide in the middle of the circle. This stand-your-ground defense mechanism is an excellent way of conserving energy in the harsh arctic environment. Also, note the large horn boss on the rightmost bulls forehead. 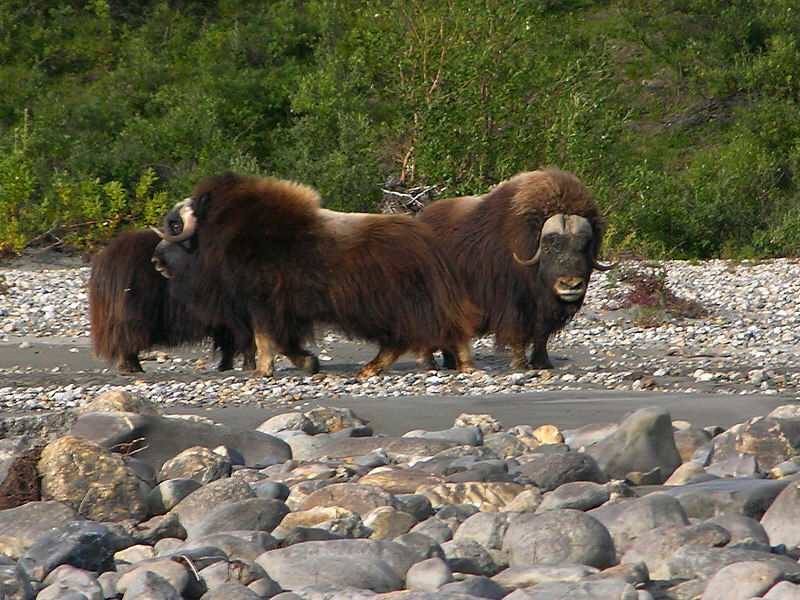 Testosterone filled head butting is the name of the game when bull muskoxen compete for cows during the rut. A 30 yard standoff, a running start, and a head on collision with something like a brick wall at the end is about what the strength test boils down to.